Elle Klass is the author of mystery, suspense, and contemporary fiction. Her works include As Snow Falls, Eye of the Storm Eilida’s Tragedy, and the Baby Girl series. She is a night-owl where her imagination feeds off shadows, and creaks in the attic. Visit her website at https://elleklass.weebly.com. Eilida is planning to meet up with friends at the local bar, but instead something draws her to the neighbors' house. As she slow sneaks over and looks in, what she sees is so horrific and terrifying that she takes off running. It has started storming hard, but she just keeps running until she slides down a hillside, landing in a heap against a rock. Sunshine is a receptionist at the Lyden Times Newspaper and she loves her neat and orderly world, only this day nothing is neat and orderly. A young woman was found in the woods with no identification and no memory, and the strange thing is that she looks just like Sunshine only with a different color hair. 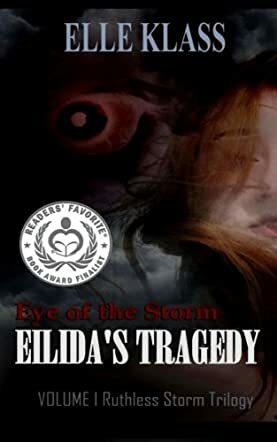 Eye of The Storm: Eilida's Tragedy (Ruthless Storm Trilogy) (Volume 1) follows Sunshine as she turns reporter and tries to discover what sent this woman running and ending up in her town. Eye of The Storm centers around Eilida's fear of storms. She hates them, and as the story progresses we slowly learn the reasoning. Sunshine, on the other hand, can never remember a day of rain, but as she investigates this case, she is suddenly plagued by storms. Author Elle Klass creates a compelling story using tragedy, survival, guilt, repressed memories, visual triggers and storms to create a tale that encompasses so much more than you expect. The tragedy of three families is told in this one story. It is a well written and compelling tale with an amazing concept that is worth the read. Great for young adults and adults as well. Brilliant writing!! The story is incredible from the very start and so captivating you will not put it down...it is EVERYTHING you want in a story: Intrigue, excitement, quite literally 'sit on the edge of your seat' exciting, very unique which is what makes it such a page turner and the characters are superb as well!! YOU will LOVE this book...it is most definitely a MUST read!! BRAVO Elle Klass BRAVO! !